Carapace (top) brown or gray without a pattern, but often may be brown or orange in the center, especially in young. Walking, can climb inclines, good diggers. Activity patterns seasonal--rainfall and temperature influence many activities. Most active during early spring/summer and fall (before cold weather). Several tortoises occupy the same winter den. Burrows used by one tortoise or a breeding pair. Mostly grasses, leafy plants, and flowers. Depends on environmental conditions. Every 1, 2, or 3 years. 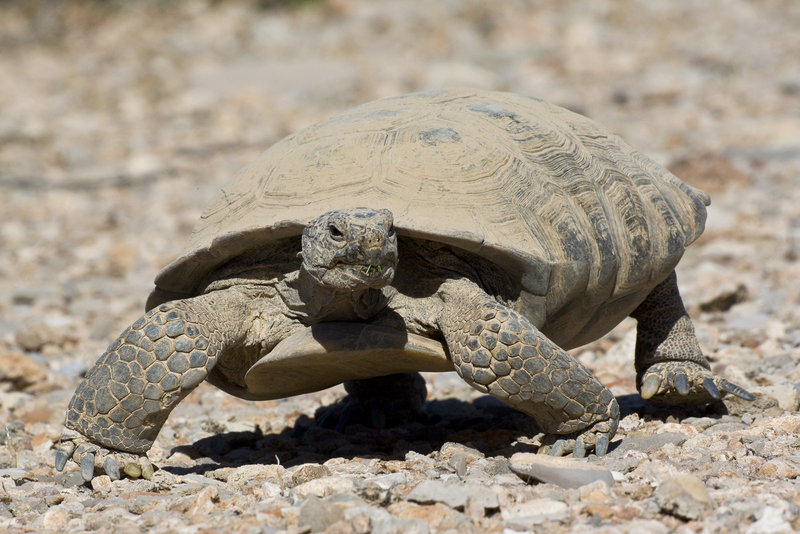 Learn how research conducted by San Diego Zoo Global and its partners has shaped desert tortoise conservation programs.